I have a quirky philosophy when it comes to creating a new design. For me, creativity happens when I work with materials that I already have. It causes me to think outside of the box. Unlike many of my friends, who have a vast collection of beading goodies, almost every beading material I own easily fits into a 3 by 4 foot cabinet. I have to admit, there are many days that I would love to have an entire room filled to overflowing with beads. It would be like Christmas...every day! My philosophy does have some negatives. One of which is that designing takes a long time for me. There are times when I have completely exhausted any possible color or bead combo and still believe I must have something that will work that will make my mess a masterpiece (this has not happened yet, but I still hope). This phase can take weeks before I finally give in and go bead shopping. Another negative is that it really makes my brain hurt trying to think of all the possible stitches to try with "this" bead and "that" color. It makes it virtually impossible to interact with anyone in an intelligent manner. When I take it too far, blank stares and Cro-Magnon grunts are the only responses I give to my unfortunate family and it can last for days. So, I'm trying to keep things simple...occasionally. Here is a design that I believe accomplishes that. Even though this uses few materials and an uncomplicated pattern, it does have some personality. I think I might try a complimentary color scheme next time to see what happens. What do you think? Some of you may know that I'm not vey daring when it comes to using color. What colors would you use? I've always been fascinated with dominoes and love watching people come up with elaborate mazes. Watching someone carefully set one up, hoping that none get knocked down until it's completed. Then when the time comes, I'm like a cat watching fish in a fishbowl...completely mesmerized. While playing with some Czechmates Two-holed Tile beads one day, I thought, "How can I make them look like they are falling down, like dominos?" It took a few months of playing with the tiles and pondering different ways to achieve this. This colorway is so striking. 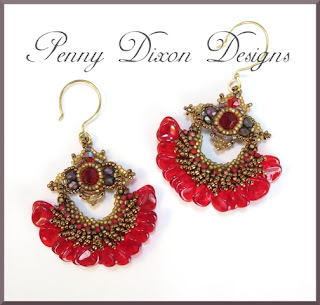 I used 24K gold plated Czechmates Tiles, 3mm Marbled Gold Siam Ruby fire-polished rounds, 3mm and 4mm Bronze rounds, 11/o Gilded Marble Red seed beads, 11/o and 15/o Bronze seed beads. 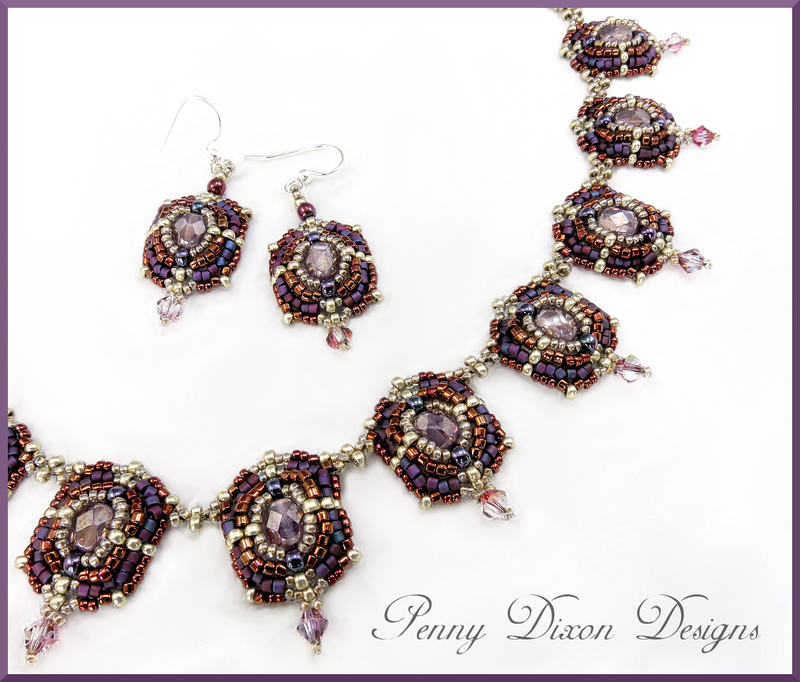 For a softer look, I used Opaque Rose/Gold Topaz Czechmates Tiles, 3mm Opaque Luster Amethyst fire-polished rounds, 3mm fuchsia rounds, 4mm flax rounds, 15/o and 11/o permanent finish Starlight seed beads, and 11/o fuchsia seed beads. Bricks and Tiles and Seed Beads, Oh My! Thank you to all of you who have e-mailed me. Your kind words of encouragement have been overwhelming. Not only that, I've enjoyed e-mailing you back and getting to share our love of beading. Many of you have shared pictures of your own work and I hope that will continue. I receive great joy in seeing the amazing creativity you all have. For those of you who may not know yet, I live in a beader's desert. The closest store is two hours away so connecting with you, who visit my blog, is like a tall glass of ice tea (it's still 90 degrees here)! This past July Starman, Inc. had a design challenge asking participants to incorporate at least two of their two-holed Czechmates beads into an original design. Here is one of my entries. 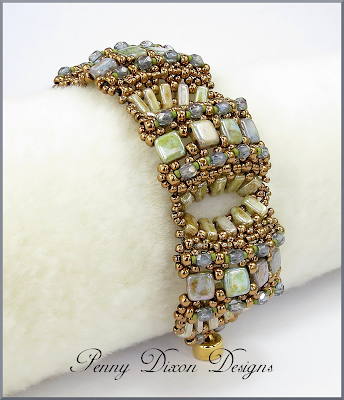 This bracelet, which I named "Bends and Bows", reminds me of some of the ancient Greek and Roman bridges that still stand today. This design received second place! What a wonderful surprise it was. I'll be posting more pictures of this in other colors later. It's really a striking piece to wear and with the magnetic clasp, is easy to put on and take off. The two-holed Bricks form a strong three-dimensional bend for the bowed sections of two-holed Tile beads. I'm creating a tutorial for this and will have it available at my new ETSY store soon. Yes, I'm finally getting a store up and running. I only have one pattern available right now. The Peacock bracelet pattern has been the most requested and is now available. 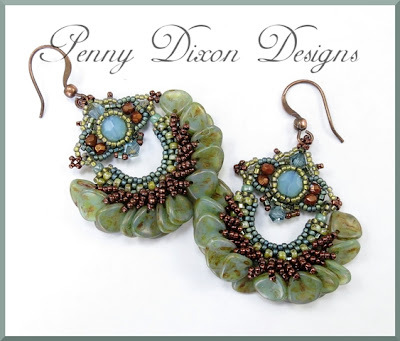 My shop is Penny Dixon Designs and all patterns will be available for instant download. For those of you who have been selling you jewelry or tutorials know what it's like to get started. There is so much to learn and store in my middle-aged brain. Any advice is much appreciated! 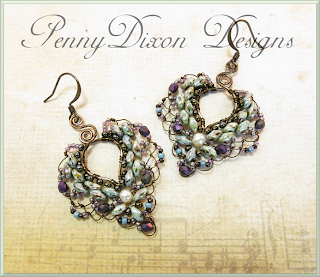 Thank you, to all of you who have written to me about the Yafa Petal earrings! Your encouragement has been such a blessing to me! Many of you have requested the bead colors that I used for the alternate colorways from the Beadwork article. So, I've decided to post them here for you. I've also included the corresponding letters found in the instructions. Keep reading! There will be a list at the bottom of the post. I have a good friend who doesn't like to wear long earrings, so I made this pattern into a pendant. Here is how it turned out. I've also added the colors used in the pendant in the list. Happy beading and thank you again for all of your encouragement! Whenever I have to ask the question, "How is that done?" I'm automatically propelled to find the answer. It doesn't matter if it has to do with the physics involved in developing the famous domed cathedrals in Florence, Italy or creating an elaborate sculpture out of duct tape. I've just got to know how it happened. The same goes for many three-dimensional pieces of beadwork I've seen. This type of beadwork does not come easy to me, so of course, I am compelled to learn (sometimes to near madness) everything I can to develop my skills. Maggie Meister's book, Classical Elegance, has a fabulous section on architectural elements that inspire her work. 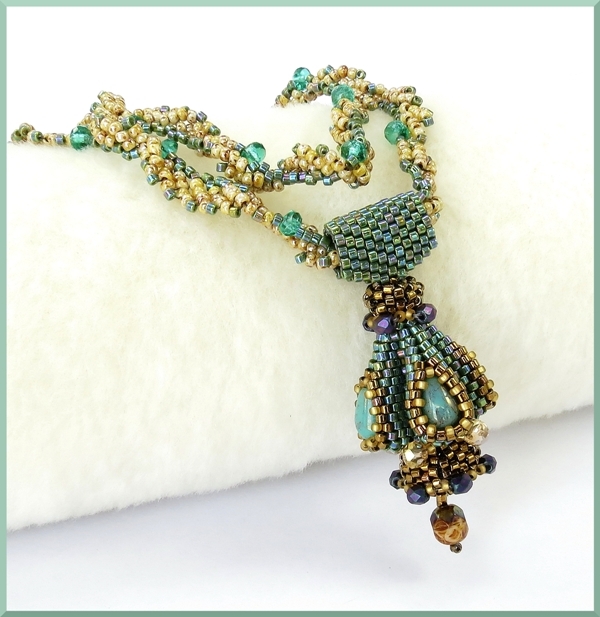 Her,"Santa Sofia Pendant", is a wonderful example of how particular stitches can be used to create shapes I thought impossible to do. Here is my modified version of her pendant. 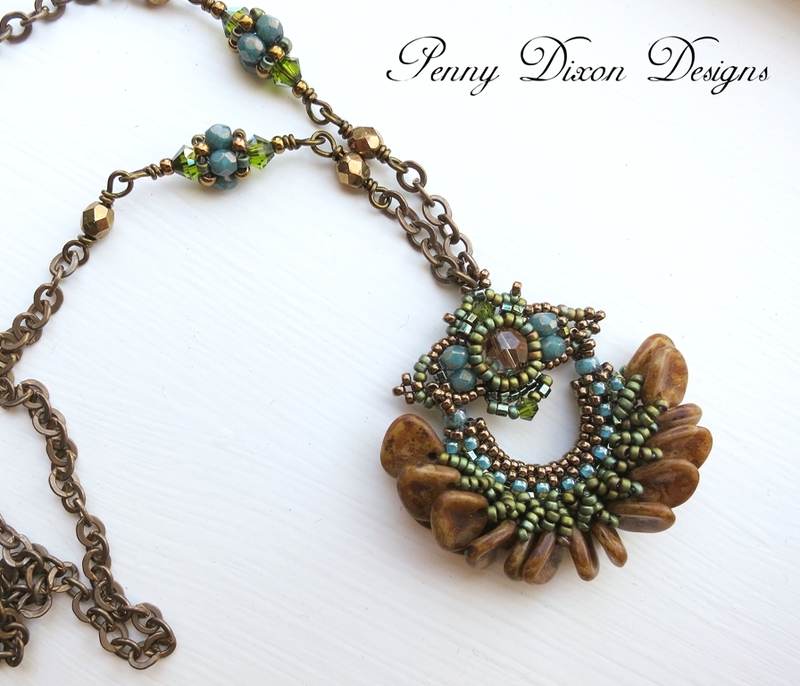 I used Czech 6x9 mm turquoise drops and a Czech 6 mm fire-polished bead for the drop. I also modified the size and made it a bit smaller than her pendant. All in all, it was a great first experience in three-dimensional beading. I know what I'll be doing the rest of this summer! Happy beading! Some of you may be wondering where I've been? That same question has been on my own mind! I've been having issues with my blog domain name and as a result, my blog could not be seen by anyone. This problem was something I didn't become aware of until an editor from Beadwork brought it to my attention. My long-suffering husband went to work and after a month of figuring out what went wrong and connecting with the right people, I'm back up and running! A lot has happened since I last wrote. 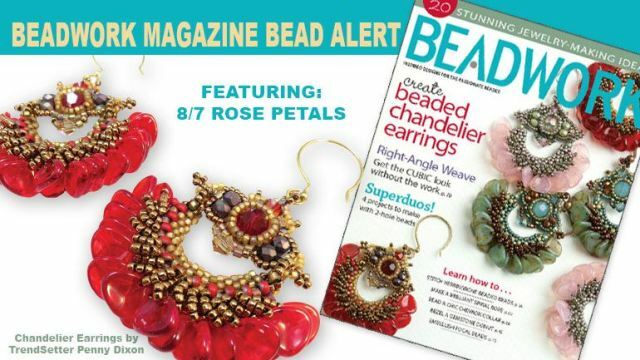 This past month, Beadwork Magazine published my "Yafa" Petal Earrings design using the new Czech 8mm Rose petal. Earth tone colors that work any season of the year. I was shocked and surprised to see that they also made the cover! I'm so happy for Starman, Inc. They are responsible for creating and manufacturing the new 8mm Rose Petal beads. Here is what the they looked like. 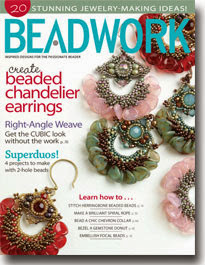 This image came from Starman, Inc. showing the cover of Beadwork Magazine. They were wonderful to work with and the cover looks amazing. This color combination can be found in the article in the August 2013 edition of Beadwork Magazine. The yellow petals really make this combination pop...very fun for summer! Soft, romantic and feminine colors look very vintage to me. Also, this past month Bead & Button Magazine published my "Captured Heart" wire lace earrings. You can see more color combinations in the post "Super Duos and wire...say what?" 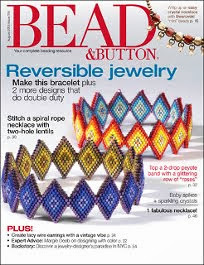 The people at Bead & Button Magazine were also a great pleasure to work with. 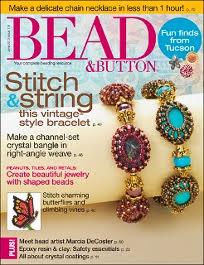 If you don't receive Bead & Button Magazine and want the instructions, e-mail me. They also are available for purchase. Happy beading! 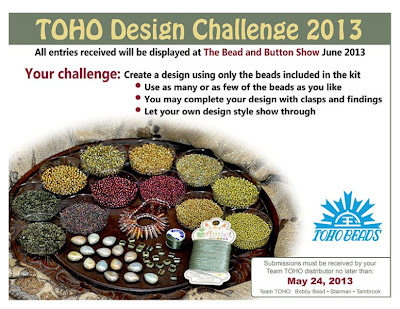 To help promote the Toho Design Challenge 2013, I made a few designs for the Bead & Button Show coming in June. I'm not one to enter design challenges. 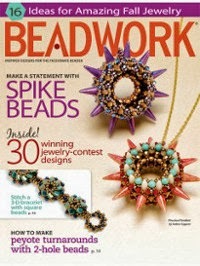 I just enjoy promoting great new products and playing with beads. So when Joelle Nicholson, Creative Director of Marketing at Starman, Inc., asked me if I would like some beads to play with, of course I said yes! Well, she didn't actually say, "Do you want to play with some beads?" That's just what my mind heard. 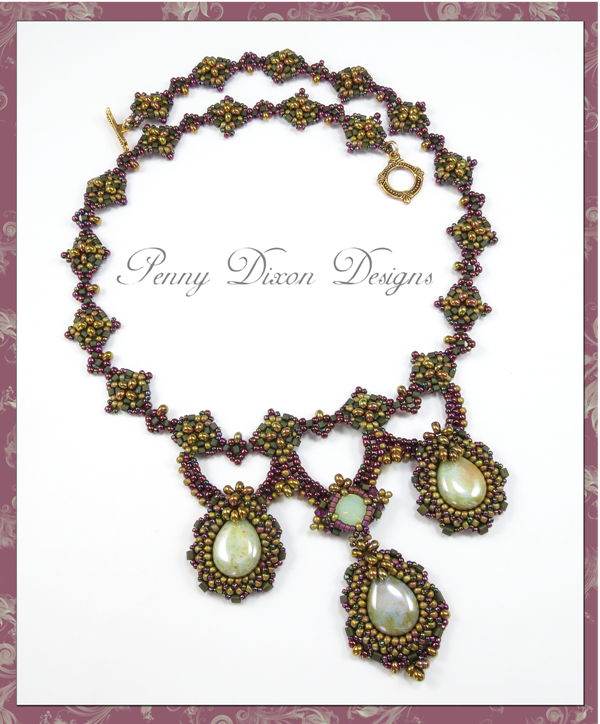 These wonderful kits will be available to the public starting at the Bead and Button Show this June. Before I show you what is in the kit, I want to share a couple of designs I came up with using mostly everything in the kit. I tried not to use items from my own stash. For me, this way of designing pushed me to be more creative. 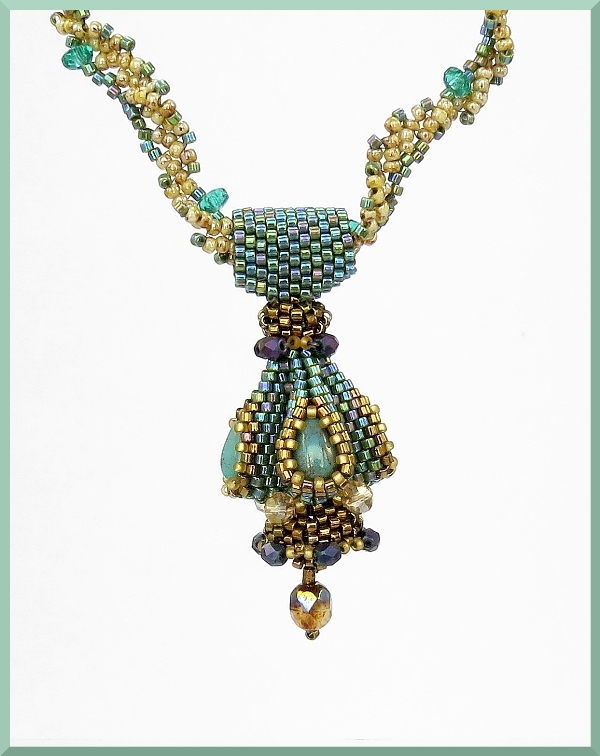 This necklace incorporates magatamas, cubes, round seed beads, and large drops. It reminds me of pieces I've seen worn by in the 19th century. The only beads I used from my own stash were an 8 mm Chaton and Toho Treasures for the bezel. I recently posted these earrings, but I wanted to show them again because they were also made using the beads from the kit. I hope this inspires you to request a kit and see what you can create. So, without further delay, here is what the kit looks like. I am completely and unabashedly addicted to beading. I'm wife to "Mr. Selfless" and homeschool mom to two remarkable boys (no, I'm not biased)! I also provide 24 hour bellhop service to my Golden Retriever and farm kitty. In my spare time, I can be found with a cup of tea, a chick flick in the DVD player and a tray full of sparkly beads waiting to be created into a little piece of joy. This is so much more cathartic than folding laundry! I'm honored to be a member.